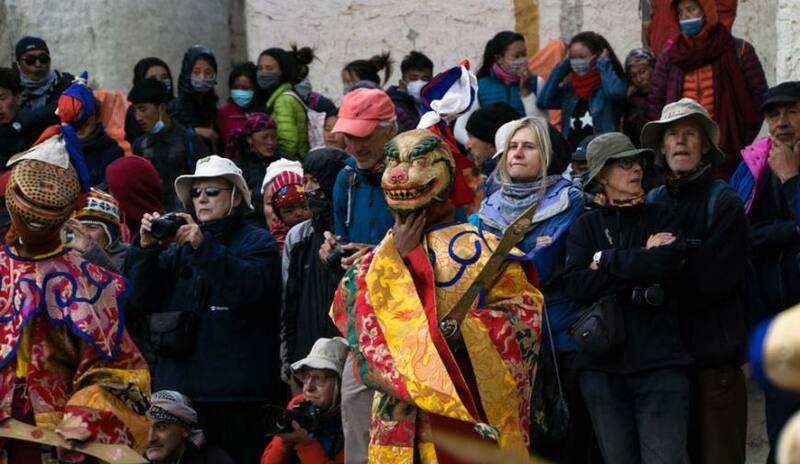 Mustang Tenji Festival Trek is an annual event indigenous to Lo-Manthang. Tenji commonly pronounced “Teeji” is abbreviated from the Tempa Chhirim which translates to “prayer for world peace”. Tenji commemorates the victory of Buddha’s incarnation as Dhorje Sonam, over a demon called Ma Tam Ru Ta, who was a man eater and who caused storms and droughts to destroy people’s houses and livestock. 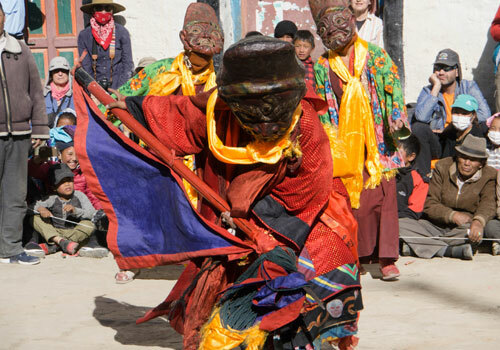 The dances, called Chhyode Gumba, are performed by the monks of Lo-Manthang during the three day festival. 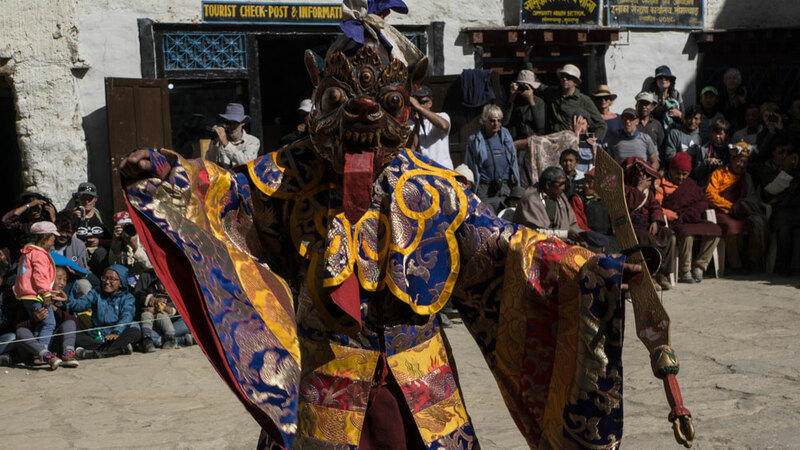 The dances enact the harassment of the Ma Tam Ru Ta, the births of the Dhorje Sonam and the demon’s son and attempt by Dhorje Sonam to return the demon to the Buddha realm. 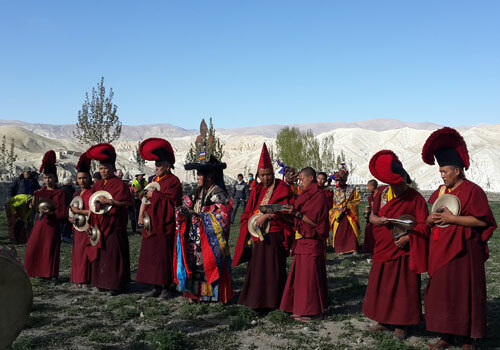 The monks perform a dance called “Tsa Chham” on the first day of the Tenji and “Nga Chham” on the second day. 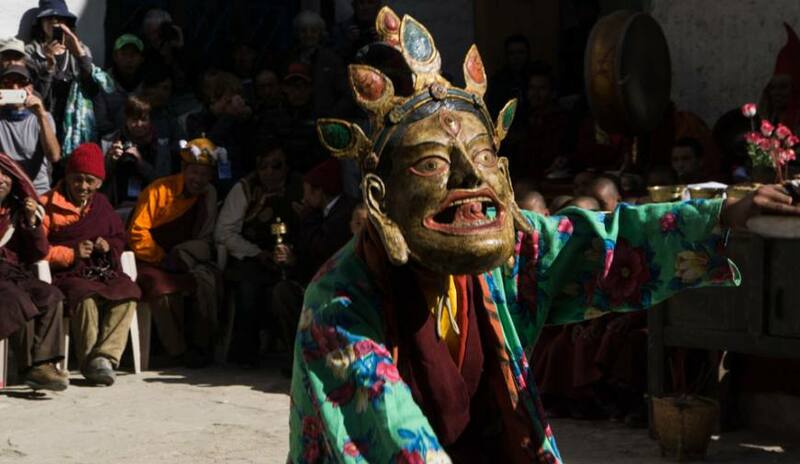 One monk has to stay in seclusion for three months during the winter preparing for the role of Dhorje Sonam. On the third day, in a ceremony called “Rha Chham” this monk, in the role of Dhorje Sonam, throws the effigy and Tsamppa representation of Ma Tam Ru Ta. It is believed that the villages are purified of evil spirits at this time. 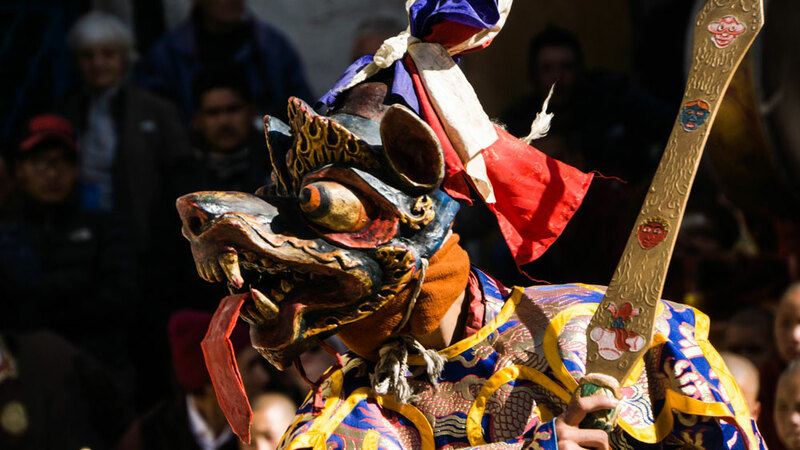 Mustang Tenji Festival falls on the 27th to the 29th days of the third month of the Tibetan calendar (April/May of every year). 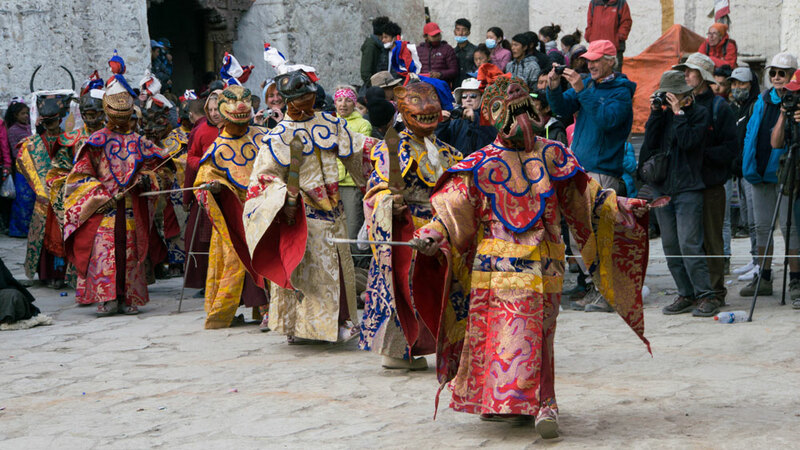 Villagers from all over “Lho Tshu Dhyun” (the ancient kingdom of Lo) come to watch the dances and to participate in the accompanying festivities. 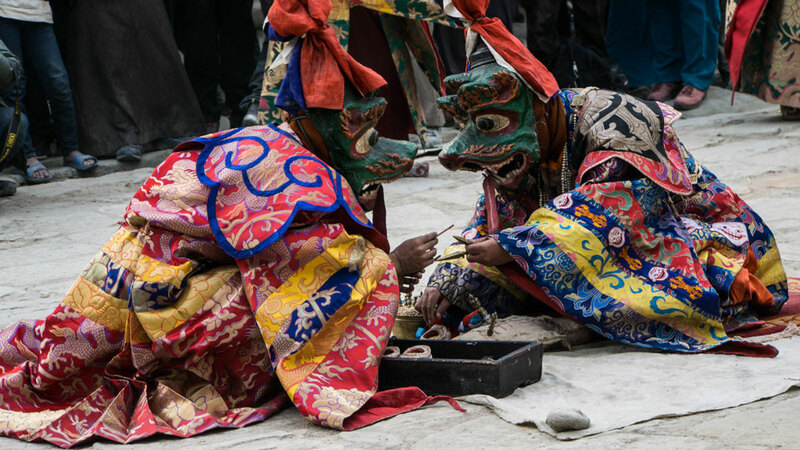 The villagers of Lo also contribute firewood and necessary material to undertake the festival. 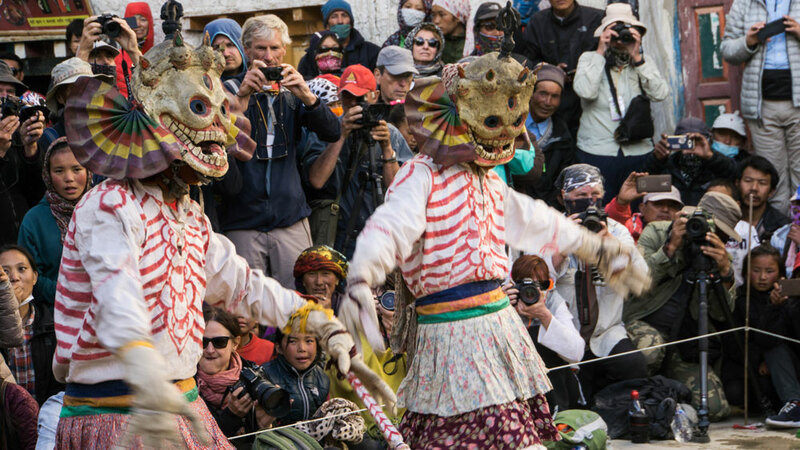 Mustang Tenji Festival Trek in the upper Mustang region is geographically located in far northwestern Nepal. 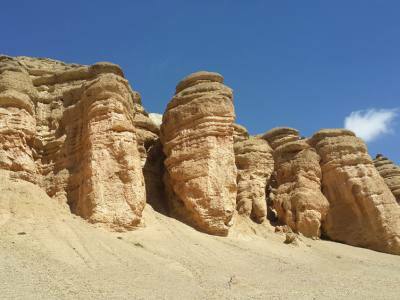 It is a place of Tibetan plateaus. 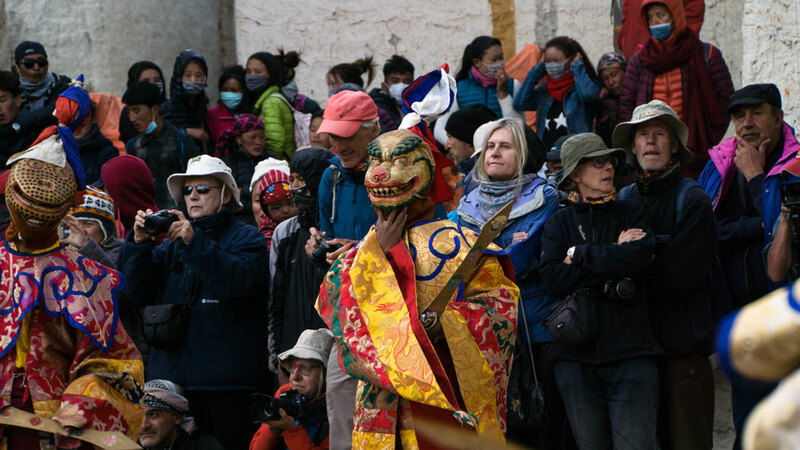 Mustang Tenji Festival Trek explores the Upper Mustang which is described as a mysterious valley and the last forbidden kingdom in Nepal. It was just opened to foreigners in 1992. 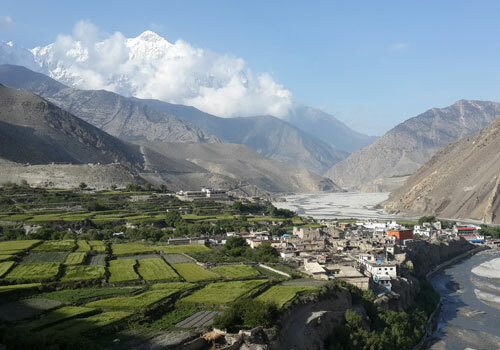 Mustang Tenji Festival Trek is an incredible trek that starts from Jomsom, which is the capital of the Mustang District. 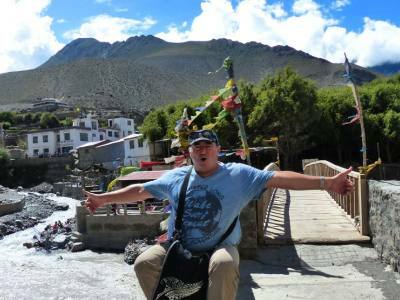 Mustang Tenji Festival Trek shows us the beautiful holy Kaligandaki River Valley, ancient Tibetan Buddhist monuments such as centuries old monasteries, stupas, chhortens, kaanis and prayers walls. 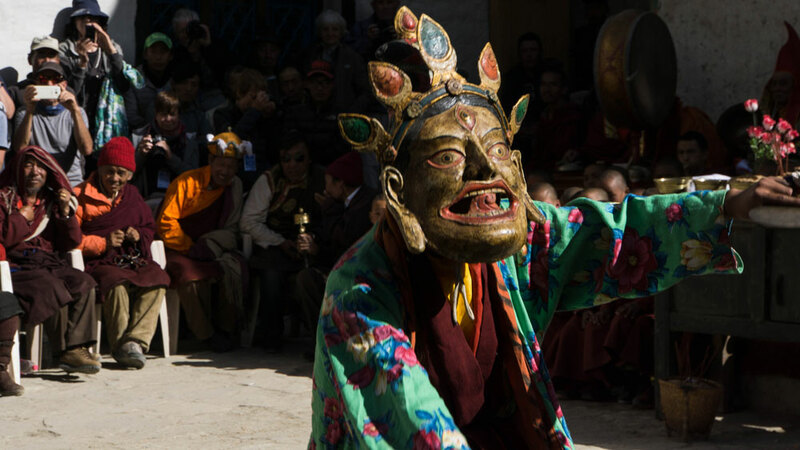 Interactions with Tibetan-like people make the Mustang Tenji Festival Trek unforgettable. 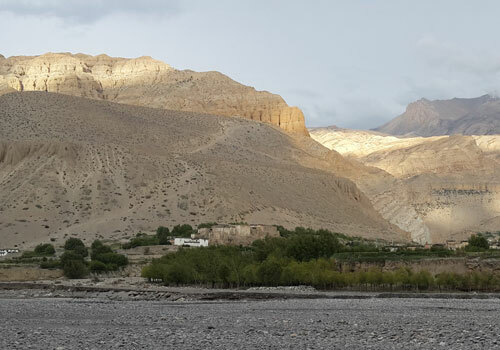 Upper Mustang, the mini Tibet of Nepal, is an area in the shadow of the Annapurna and Dhaualagiri high Himalayan range; it is a valley that receives very little rainfall during the year. 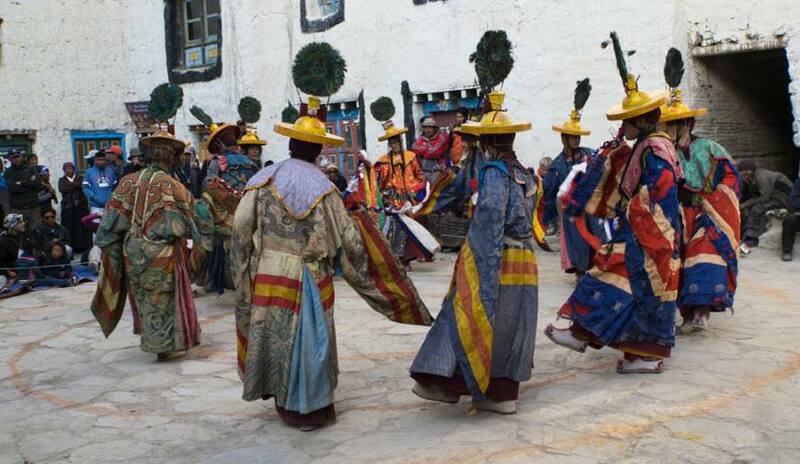 This is an open and living museum of Tibetan culture and majestic beauty of the Himalaya. 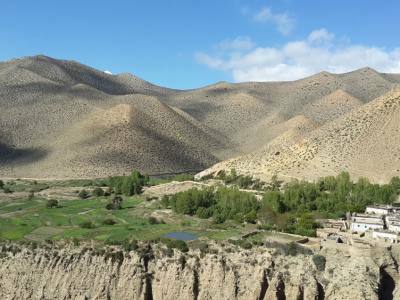 On the Mustang Tenji Festival Trek, we will observe the lifestyle including foods and culture of the Mountain People. 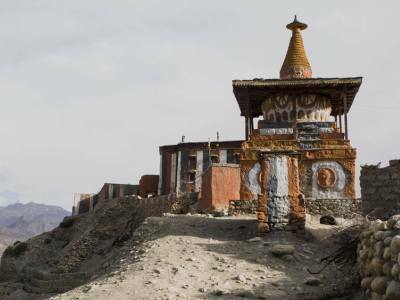 Lo-Manthang the capital city of Mustang, represents one of those few places on the planet where lifestyle and cultural heritage have remained unaffected by the rest of the world. 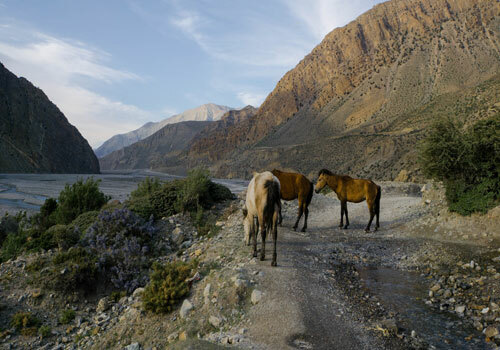 Hidden behind the high Himalaya range, Mustang is filled with some of the best trekking destinations in the world. Explore the Holi River Kaligandaki Valley. Day 01:Arrival in Kathmandu (1,350m/4,428ft). 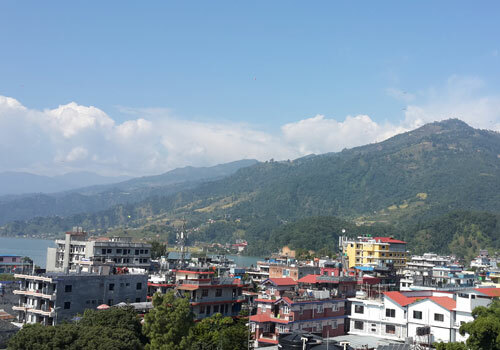 Day 03:Drive to Pokhara (850m) by tourist bus – 7/8 hrs. 3-star hotels in Kathmandu and Pokhara with breakfast. Local licensed export English speaking guide. Food, accommodation, salary, Transportation, insurance, equipment and medicine for all staff. 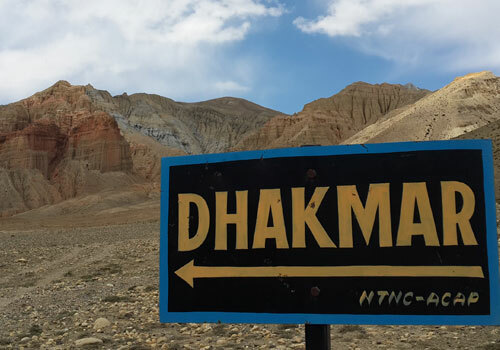 Special Upper Mustang Trekking Permit. 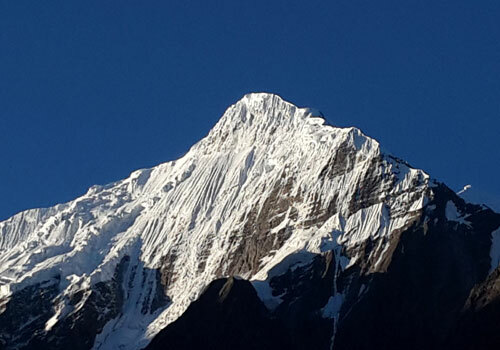 Annapurna National Park permits (ACAP) for trekking. Down Jacket and sleeping bag by Tourist saga Tourism (which need to be returned after the trek). Travel insurance which covers emergency Rescue and Evacuation (compulsory). Nepal entry visa; you can obtain a visa easily upon your arrival at Tribhuwan International Airport in Kathmandu. (Multiple entry 15 days US $25 or equivalent convertible currency, for 30 days can be obtained by paying US $ 40 or equivalent foreign currency. Similarly, Tourist Visa with Multiple Entries for 90 days can be obtained by paying US $ 100. Please bring 2 copies of passport size photos). Mineral water, Alcoholic, and cold drinks. Tips for guide, porter (Tipping is expected). 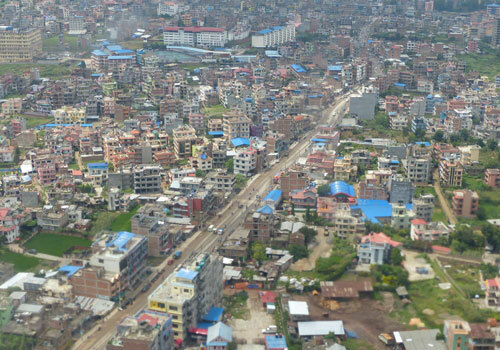 Heartily welcome in Kathmandu, the Nepalese capital and cultural hub. We’ll be waiting with a warm greeting and easy transfer to your hotel by private tourist car and early evening overall briefing about your trek (introduction with guide). 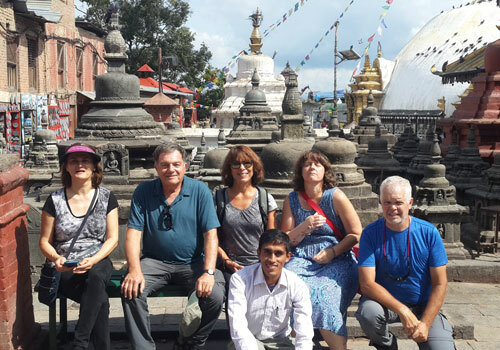 Today after breakfast we start a cultural tour some of the most historical and architectural attractions of world heritage sites in Kathmandu valley which are listed by UNESCO. 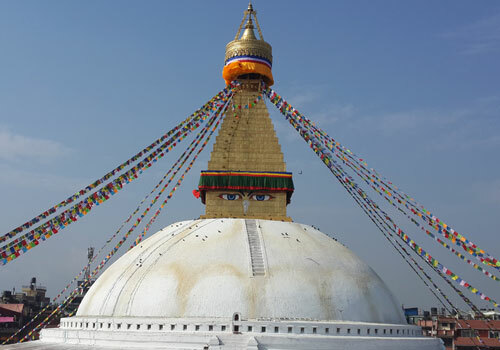 We visit The famous Temple in the town 'Monkey Temple' (Swayambhunath), historic Kathmandu Durbar Square, Buddhist shrine (Bouddhanath), which is the largest Buddhist stupas in the world and Hindu divine temple of Pashupatinath. In the evening introduced to fellow participants, and briefly discuss our trip. Drive to Pokhara (850m) by tourist bus – 7/8 hrs. Today we are formally starting our trip from Kathmandu early morning having breakfast in our hotel before this need to be ready position to finish all backpack. We pick at the hotel around at 6:30am and heading to the bus station. The bus Kathmandu to Pokhara leaves at around 7:00am. The buss normally stops two times on the way for lunch, snack breaks. We have beautiful river valley with the rice, millet, crops tarries which give us refresh all the time in this long drive. 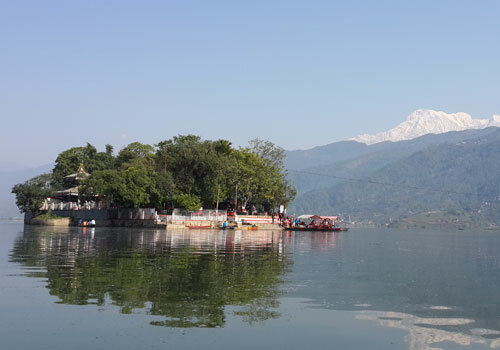 Finally in the afternoon we reach a beautiful valley set on the banks of the Phewa Lake, Pokhara is also known for its panoramic views of Annapurna, Machapuchare (shape of fish tail) in the north, and Dhaulagiri in the west, LamjungHimal and Manaslu in the east. It is smaller, clean, natural and much less crowded than Kathmandu, hence providing the perfect starting point for our trek. Max. Altitude: 8,50m/ 2,788 ft.
We will take morning flight from Pokhara to Jomsome. Jomsome is the headquarters of Mustang District. We will take some hot drink and to manage overall our bag pack and slowly start. Now we are very close to the Mt. Nilgiri just in front of us the view is magnificent. The trails continuous to the north east take us to beautiful place Kagbeni. In the afternoon we explore Kagbeni, where it is very old structure of houses, temple and almost 700 years old Kagbeni Monastery. Kagbeni is one of the unique and interesting villages. 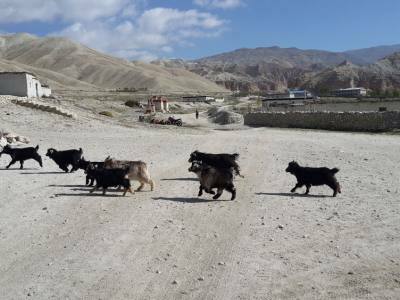 It is the get way of Upper Mustang Kingdom. Stay overnight in Kagbeni. First we check in our special permits in the Kagbeni Check point then we begin our trek alongside the Kali Gandaki River Valley on the right hand side. The way is wide and gradually up with the breathtaking beauty seen. The valley is very dry and rocky only small rainfall happens during the whole years in this region. We reach Tangbe village, where it is barley and buckwheat fields, apple farming are the identity of this small cute mountain village. We continuous our walk to the Cehhuksang; we will take our lunch break. The read clef in the mountain are really amazing we continuous along the River side. We cross the suspension bridge, where the River passes through small cannel is interesting. Just above the bridge cluster of 16 caves also known a Mustang gate, which is incredible gift of nature. Next, we climb up then we reach Chele. Stay overnight in tea house. Today we start quite early in the morning after having our breakfast in Chele. Today is long and might be hard walk due to step up hill and very strong sun fell warm. On our way, we enjoy great views of Nilgiri, Tilicho, Yakawa Kang and DamodarDanda. We heading further up and reach Samar Village. After here the trails more step up hill then we cross almost 3800m. Next, we decent on a step trail to Syanbochen. Syanbochen is a small settlement with some tea house. Stay overnight in Syanbochen. Another long day begins early in the morning. The view of the mountain is pretty. We gradually uphill then we ascend Yamda La Pass at 3,850m. 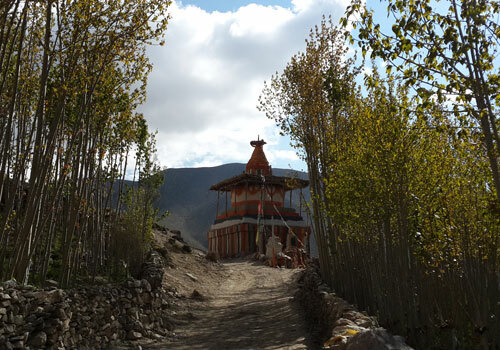 On the way we pass by a few village and amazing Chorten (Temple). We reach at the top call Nyi pass at 4,010m. From here the trail continuous downhill takes us the large beautiful village Ghami. We will take our lunch then start to heading down to the GhamiKhola (stream). And gradually uphill through the very long Mani Walls (Prayer walls), which is so amazing. The red and white cliffs in the mountain are magnificent views. We start to step walk again to reach the Tsarang La Pass at 3870m. Next, start to gradually downhill take us to beautiful place Charang. 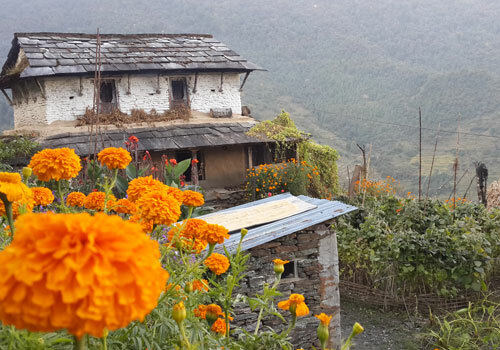 In the afternoon we explore Tsarang Village, visit Gumpa. The overall village is looks living museum we can observe mountain people lifestyle. 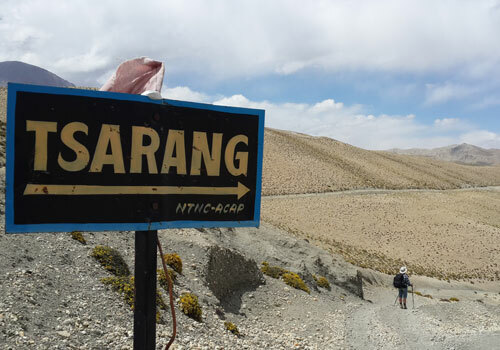 Stay overnight in Tsarang. Today is quit short and easy walk to Lo- Manthang. Almost all the way is gradually uphill with the miracle seen of the Himalayas. On the way we have very beautiful Chorten. The trails is continuous uphill take us to Lo La Pass at 3950m. From the top we can see wonderful view of Lo-Manthang town as well as beautiful mountain range including Nilgiri, Tilicho and Annapurna I, Bhrikuti Peak as well as Damodar. After half an hour gradually downhill take us to Lo- Manthang. In the afternoon around 2pm the festival is start in the central of the town just in front of King Place. 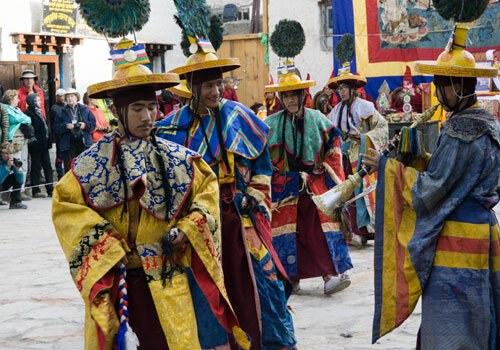 Monks present their dance with special religious songs. It is really amazing dance. We watch and take a photo. For photograph we need to buy ticket and it cost $10 USD. There are a lot of people including both visitors and local, everyone is very curies. The program is almost 3-4 hours.Stay overnight in Lo-Manthang. 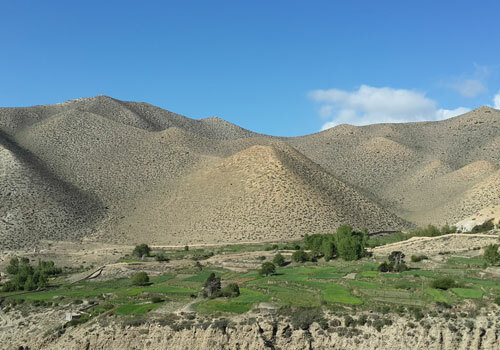 In and around Lo-Manthang are really beautiful places. In the early morning we walk along the River couple of hour with the easy flat trails take us to nice Choser Village. First we visit cave monastery which is amazing location and structure. Next, we climb spectacular multi stored cave with more than 44 rooms. In and around Chhosyar is stunning landscape. We return back Lo-Manthang in different way which is the mostbeautiful part of whole this trip. There is especially very old village, colorful cliffs, cave, Chhorten, Monastery, buckwheat farming so amazing. After all of this we back to Lo- Manthang. So, today is the third day of this Teeji festival it is much interesting and top day of festival. The dancing program also shows in open space in the farm, which is so incredible. All the people are amazingly happy and enjoy seeing all of this. Stay overnight in Lomanthangand having rest and sleep. Our way back from Lo-Mantang is diffrent. First gradually uphill then we reach at the top our trail passes through Gyakar Village, where one of the oldest GharGompa and beautiful Land scape. We explore Gomap and continuous trek to Drakmar. In the afternoon we explore some cave and Gumpa. The cliffs are really nice with the different colors. Stay overnight in Drakmar. It is good idea to start quite early in the morning to avoid strong wind in the afternoon. We gradually downhill an hour then we reach Ghami village. After here the trail is step up hill. Then we are in the top of the hill. Nest, heading down take us to Ghiling village. It is comparatively green village. We explore highly sacred gumpa. Stay overnight in Ghiling. After having breakfast, we walk on the same trail as before going up to Lo Manthang. Today most of the part is downhill. On the way back to Chhuksang we can enjoy wonderful views of the Himalayas and small mountain villages. Stay overnight in Chhuksang. In the afternoon can be explore some black Fossils in the bank of River. Stay overnight in Chhuksang. We continuous follow Kali Gandaki River valley. Can be start early in the morning to avoid very strong wind in the valley, normally wind start around 11 am. The different looks of the valley so beautiful. We stop and sign to check out in Kagbeni check post. We take our lunch in Kagbeni. In Kagbeni is also junction of Annapurna trek. Then continue trek to Jomsom. Stay overnight in Jomsome. We catch an early morning flight to Pokhara after our long mountain journey. The airplane passes through a gorge between Annapurna and Dhaulagiri Mountains making the flight itself an amazing experience after reaching Pokhara, we can take a rest. In the afternoon do some souvenir shopping. Boating in the Fewa Lake will be great experience. Later after and evening we hike along the Lake Side Street which is the best choice among Visitors. We leave from Pokhara in the morning, after reaching Kathmandu; we can take a rest. In the afternoon do some souvenir shopping. There will be a farewell dinner in the evening to celebrate the successful completion of our journey. Stay overnight in Kathmandu. Your adventure in Nepal comes to an end today! Wish you all the best!! Hence, exchange emails with your travel companions (ZamZam Trekking P. LTD) and organize your photos. A representative from ZamZam Trekking will take you to the airport, approximately 3 hours before your scheduled flight. *Please, note that it is also possible to drive back to Lo-Manthangby Jeep if you want stay as long in Lomanthang or might be whole trip shorter couple of days or more time in Kathmandu, Pokhara. We trekking back almost same way when going up that means it is also good idea. So, please inform us to ensure your interest. You are most welcome to create your own itinerary list. Please note that, if possible, we always suggest that you plan one or two extra days in your trip.